This recipe is a mouthful. Jeni's ice cream shop opened up a location in Atlanta about a year ago. Since then, I've been a few times. One of the most remarkable flavors that Jeni's has is a goat cheese and cherry ice cream. It's an artisan ice cream with tangy goat cheese, roasted cherries, and a richness that can't be bought in a grocery store. This recipe is a play on the Jeni's goat cheese and cherry. 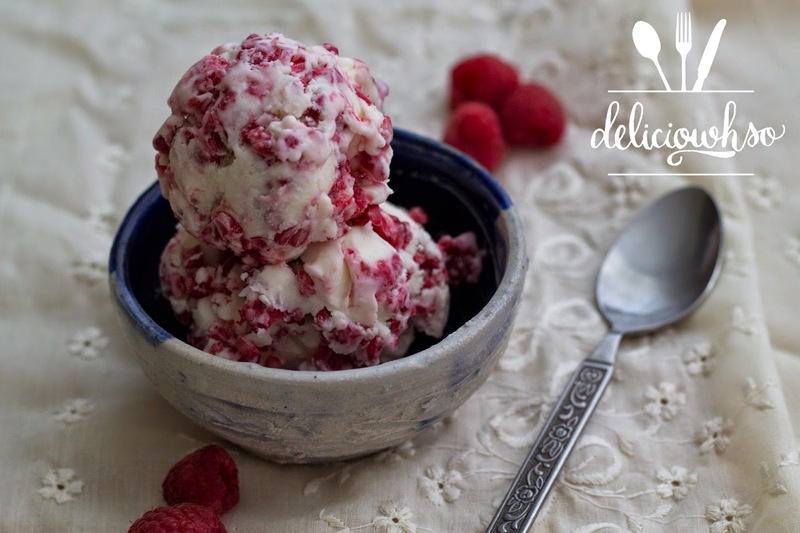 I took some raspberries and mascarpone cheese and added it to to this recipe. 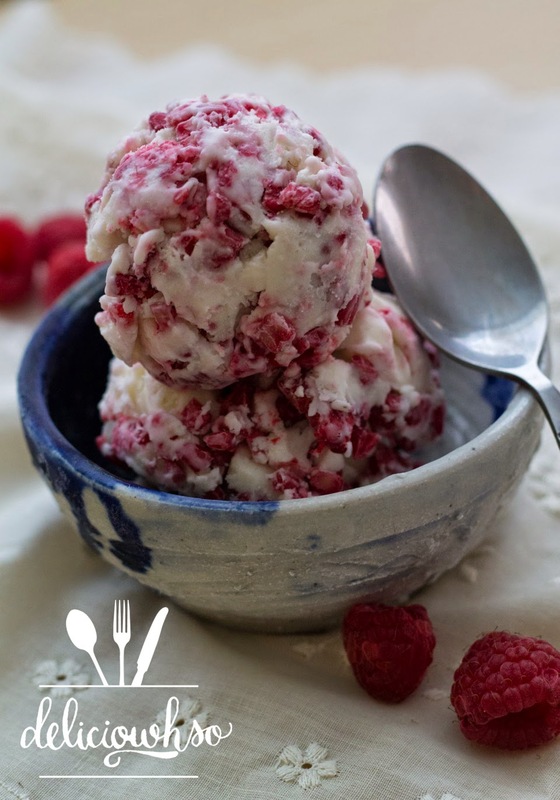 The raspberries are a perfect texture change from the smooth ice cream, and the jam is a great way to complement the honey goat cheese. 1. Prepare your ice cream machine as the instructions direct (for mine, I have to put the freezing vessel into the freezer overnight). 2. Make a slurry with 1/4 cup Milk and the corn starch. Whisk it together to combine. 3. In a medium sized pot, put the remaining milk, cream, corn syrup, sugar, honey, and salt. 4. Bring the pot ingredients to a boil. Allow to boil for about 4 minutes. 5. In a separate bowl, mix the goat cheese and mascarpone cheese together until well incorporated and smooth. 6. After the ingredients in the pot have boiled for 4 minutes, slowly pour the slurry of milk and corn starch into the pot while mixing with a rubber spatula. 7. On medium heat, allow the mixture to come back to a boil and cook for about a minute, stirring constantly. The mixture will be finished when the starchy flavor cooks out and the consistency becomes slightly thick. 8. Pour a little bit of the hot mixture into the cheese, mixing to incorporate. Repeat until the mixture is smooth, and all of the hot has been incorporated. 9. Cover the mixture with plastic wrap, so that it is touching the surface. Place the bowl into the fridge until the mixture has cooled completely. 10. When cooled completely, pour into your ice cream maker and follow the manufacturer's instructions to churn. 11. When the ice cream is ready, it will look like soft serve. Prepare a container. 12. 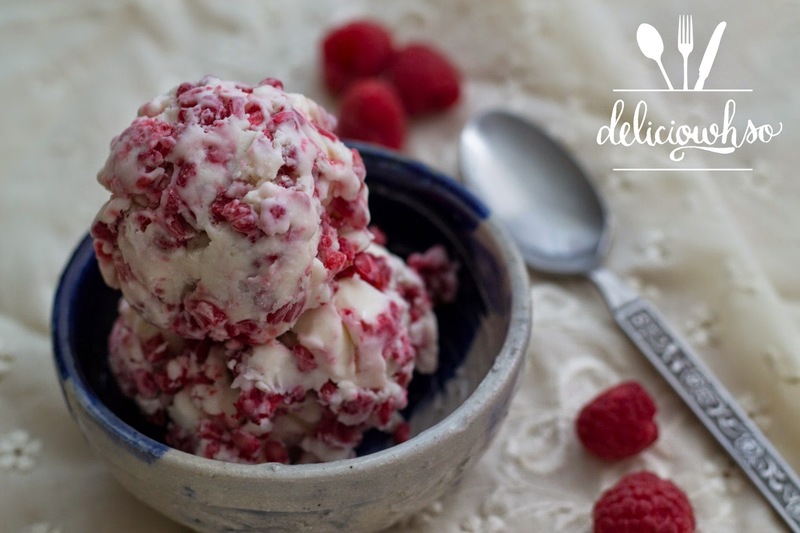 Mix in fresh raspberries after the ice cream has been spun, breaking them up slightly as you go. 13. Place layers of ice cream and jam, so that when you scoop the ice cream you get a nice swirl-effect. 14. Freeze the ice cream for at least a couple hours before serving. 15. Allow to thaw slightly, for about 5 minutes, then scoop into a frozen bowl and share! Georgia has had some really warm weather lately (I turned on my AC for the first time this year!). I can't help but crave some ice cream with the weather change (and to make me feel better about my pollen allergies). This ice cream is perfect for spring and doesn't take long to make!